We had the privilege of spending the night in this once very important but now sadly overlooked building. 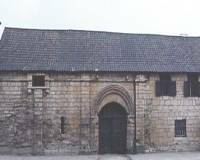 It was built in the 12th Century for Henry II and was originally outside the City of Lincoln in the village of Wikeford/Wigford, now part of Lincoln itself most people walk past it on a daily basis not really knowing the importance of the old Medieval building. Henry II came to Lincoln as part of his Crown wearing celebrations and this was one of the most important buildings in the country at the time, situated outside the City walls of Lincoln in the 'posh' area, as it was back then. In those days Lincoln was a powerful and influential place so different from the slow moving place it is today, in later life this building was taken over by the City's Guild of St Mary, the mayor of the time lived next door and opposite lived a man called John Of Gaunt, who was Earl of Lincoln. Also in this building, under a glass floor, you can still see the old Roman Fosse Way road which joined with Ermine Street just a bit further up from this building. Today the building is home to the Lincoln Civic Trust who do great work in restoring old buildings around the County, most with little help from the local authorities who seem backward in moving things forward, the local tourism people do their best with what little help they get but it seems that if the councils had their way they'd turn these old buildings into stupid things like restaurants etc. Preserving the past for future generations seems to take a back seat as huge amounts of money are thrown away on temporary 'art' projects that only a few people are interested in. After we'd settled down to start things off, a few of us felt strange sensations from headaches to sickness which went away as soon as they'd been felt. Nothing untoward happened until very late into the investigation when a few noises were heard in the North Range of the building, also the Infra Red barrier alarms went off while we were close to them but nothing was seen that could've broken the beam - this is the first time they've ever gone off 'on their own', the batteries were good and there was no reason for them going off at all. We tried various ways to get them to go off again but nothing apart from walking through the beam would set them off. Later when we asked for a louder noise to be made there was a huge 'bang' from above us. On checking above us, there was nothing to see that could've made the noise so we have to scratch our heads and wonder what it could've been. Quite a coincidence that it happened straight after we'd asked for a louder noise but we'll have to put a question mark against it as the building is obviously very old and something could've come loose. On the whole an interesting night in an amazing building that we hope to follow up on at another time. There have been a few reports of activity in this building mainly around the North Range which has always been reported as being haunted. This location is one we've wanted to have a look into for a couple of years and we finally got our chance in early December 2005. 9 months of research into the building and gathering first hand reports of things going on there set us in good stead to concentrate on the areas of interest. Due to a previous group going into the theatre and leaving it in a mess they were understandably concerned about the security of the building and how things were going to be run. We were helped by the fact that one of our members, Sarah, worked in the theatre at the time and we finally got the go-ahead to go in there. Sarah had previously been the front of house manager for the theatre so consequently any security concerns that the management had were allayed. Some of the incidents reported include footsteps being heard going across an empty stage, people being nudged slightly when no-one is around, people being seen that then vanish, objects moving or being thrown when no-one is near them, doors banging etc etc. Early ‘Theatre’ in Lincoln was performed in Broadgate and the first permanent Theatre in the City was built C1731 by Erasmus Audley. This small playhouse measured 22 x 8 yards and was situated near to the main entrance of the Castle and close to the Norman castle walls; its access was too narrow for horse-drawn carriages, so the ladies were carried in on sedan chairs. This small lane later became known as Drury Lane - it was named after a local businessman. During the late 18th century, Lincoln Theatre was the headquarters of the Lincoln circuit, which included Grantham, Boston, Spalding, Peterborough, Huntingdon, Wisbech and Newark-on-Trent. In 1764 a new Theatre was formed by Mr. William Herbert, who had been manager of the Drury Lane Theatre since 1750. The new site was ‘downhill’ in the Kings Arms Yard off Butchery Street, now called Clasketgate and consisted of a few small buildings. Mr. Herbert named the Theatre ‘The Theatre Royal’ and continued to manage it until about 1783. Taken over by Mr. James Whitely, and together with Mr. Herbert’s Players, the Theatre continued until 1806 when demand was such that it was rebuilt on the same site and lasted until 1892. A huge explosion rocked the Theatre during the night of November 26/27th and a disastrous fire completely destroyed it. Mr. Ross Challis, who was the leaseholder at this time, with the help of London architects Bertie Crewe and W.G.R. Sprague, designed and created a new, even bigger Theatre. This now had a capacity for 840 people, a large stage with no supporting pillars to block peoples’ view and plush tip-up seating; access was still from Kings Arms Yard. Mr. Challis became the sole owner and called the theatre the ‘New Theatre Royal’, opening with W.S. Penley’s Company from London’s Globe Theatre on December 18th 1893, performing ‘Charley’s Aunt’. 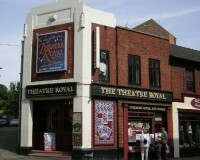 The ‘New Theatre’ became the ‘Theatre Royal’ in 1907, when a new main entrance and foyer were built on Clasketgate, and an upstairs lounge was added. The Theatre still remains on this site and has been used as a cinema as early as 1912 when it showed films for a few years presented by the London Bioscope Company and now has the facility to show modern films on 35mm cinemascope etc. Guy Gibson and other members of the RAF stationed around the County would often nip into the theatre on their nights off before drinking in 'Ye Olde Crowne' pub opposite the theatre. Next we set up more of the equipment in the areas of reported activity, a camera was placed in the auditorium on the stage pointing up to the dress circle and upper circle. Further cameras were set up in the green room, top suite, dress circle bar, dressing room corridor and wardrobe department. Hygrometers and data logging sensors were set up in various parts of the building along with other recording gear and various other gadgets such as barrier alarms and ultrasonic sensors. Nothing much happened while we were there but on checking some of the footage shot, there seems to be the sound of someone running or walking briskly in an area of the building that was empty; all participants that night were accounted for elsewhere so we will need to check that footage a bit more closely. Another interesting part was when the temperature in the upper circle dropped from 20 degrees C to 5.2 degrees in the space of approx 10 seconds, it stayed this way for the best part of half an hour - this was at the same time as the lighting started to shake. We left at approx 4.30am. The Theatre Royal is a lovely Victorian building with a really nice atmosphere and it was a privilege to be allowed to spend the time in there even though the phenomena reported didn't happen for us. This location is in the heart of historic Lincoln, close to the castle and cathedral. It used to be a pub in days gone by and has had a few historical visitors. TE Lawrence stayed here while he was stationed at RAF Cranwell under the surname of Ross, better known maybe as Lawrence Of Arabia. He wrote a revised version of his 'Seven Pillars Of Wisdom' here. A green plaque mentioning this is still on the right hand side of the wall. A few stories are connected with this place that we had heard of over the years, the main story is of a little boy who is sometimes seen running around, staff have given him the name 'Humphrey' but that's obviously not his real name. He has been seen in a couple of locations around the place by visitors and staff. Another story is of the sound of money being counted upstairs, this has been suggested as being the spirit of Lawrence sending money off to a lady friend, Lawrence was a very loyal friend to have and also had a love of old buildings. He would often visit the nearby castle and also Temple Bruer, an old important Knights Templar preceptory south of RAF Waddington.. He was very interested in medieval fortifications and the Templars themselves, he is said to have visited virtually every Templar building and castle left standing. Incidentally, Lawrence loved 'Old Lincoln' (as he called it) although he wasn't keen on the uphill part due to the many pubs there being more like brothels than anything else but said his time at Cranwell was the happiest part of his life. Staff have reported things moving about, in the '80s I heard a story that a chef had heard a noise and on investigating found a knife stuck to the floor and still moving slightly as if it had been thrown there by force. No-one owned up to it so it was interpreted as being of a paranormal nature. (I was told first hand in 2014 by an ex-chef there that he made this story up, he then public stated this on the 'You're Probably From Lincoln If...' Facebook group in 2016) Mists have been seen coming up from the lower floor to the wooden staircase and people have felt slightly uneasy at times in various parts of the building. An old photo in the building appears to show a little girl in the 2nd floor window looking out, there were apparently no children in the building when it was taken. With all this in mind we arranged to go in and have a look for ourselves. We were joined by a few members of staff and we listened to their stories of the place before setting up various bits of equipment. Unfortunately nothing of note was witnessed while we were in there apart from a spurious reading on an EMF meter, but with so many electrical items about it's not surprising. It was an enjoyable night in there and we thank the owner and staff for giving us the opportunity to go into this amazing building and spend time where the legendary Lawrence of Arabia spent a short moment of his equally short life. If you like great food then why not drop by and sample some of the menu on offer? You won't be disappointed! Maybe you'll get a visit from 'Humphrey'?